So relieved was I that my haircut went well ("That's a damned good haircut," my friend told me later--and indeed, the woman took her time and seems to have done it just so) that I went to the market in the afternoon, on my way home. 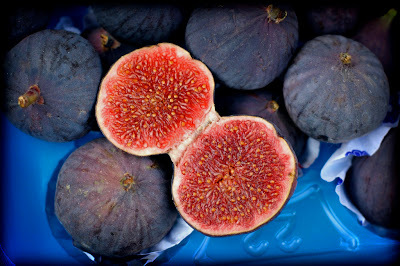 And there in the sun were my figs, my favorite figs, the fresh tasty figs I have admired for weeks. I bought a punnet of strawberries (some of which were moldy, as it turned out!) 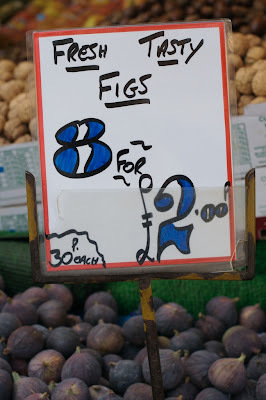 just for the privilege of asking, "May I photograph your figs?" "As long as I'm not in the picture, sure," said the woman who took my two quid. Yeah. It was like that here today. Oh yeah, and there was some writing, but it was neither fresh nor tasty: 178 words.